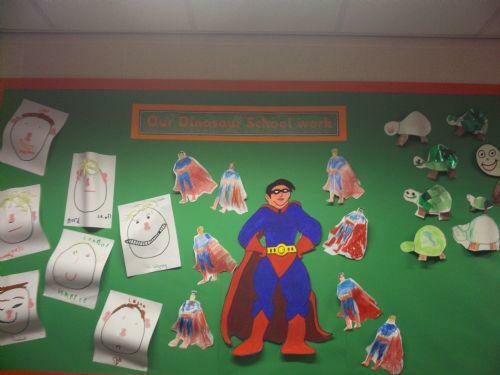 Dinosaur school develops children’s social and emotional competence. It is a series of small group sessions which are based in our school. We use DVDs, puppets, special activities, books and games to promote positive social interactions and to increase cooperation with teachers. Homework is set weekly which is usually an extension of the work they have followed in class in the week. Puppets are used in the programme as they have been proved to be extremely effective n the teaching of social skills in young children. We use two life size puppets, Wally Problem Solver and Molly Manners. We also have Dinah Dinosaur (reinforces rules as she is the Headmistress of Dinosaur school) and Tiny Turtle. We use action songs to engage and motivate children and role play to provide opportunities to practice new skills and learn different perspectives. Pupils are frequently praised, encouraged and rewarded with 'Dinosaur Pepples' that are counted up at the end of every session. If you have any questions please feel free to contact the school and speak to Mrs Natalie Owen or Miss Claire Perris.